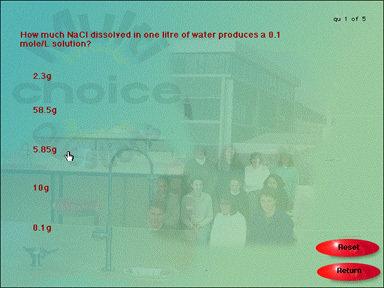 The following images are a selection from some hundreds of interactive areas from Polychem. 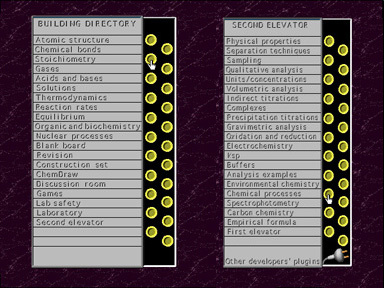 The software uses a metaphor of a chemistry department building, but very user friendly - like all chemistry departments. In the many "classrooms" there are user-modifiable notes, simulations, videos and interactive questions with model answers. The notes can be blown up for class projection. This screen shows one of the many types of computer generated questions. There is also an on-demand calculator and glossary. 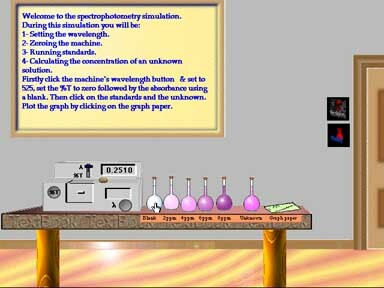 These interactive rooms in this multimedia chemistry software keep students on task and motivated for longer than has been the case with traditional teacher directed activities. 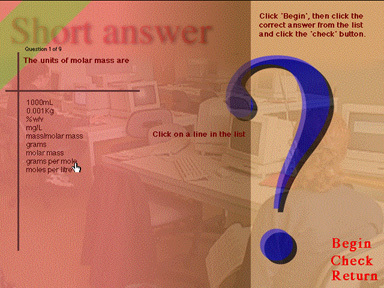 This screen shows another of the many types of computer generated questions. The computer's sketch answer is also shown. There is also an on-demand calculator and glossary. These features are highly rated by students - that's got to be saying something! 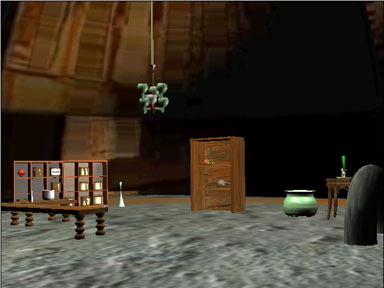 This is part of an interactive 3D environment. We don't seem to use cauldrons much anymore! 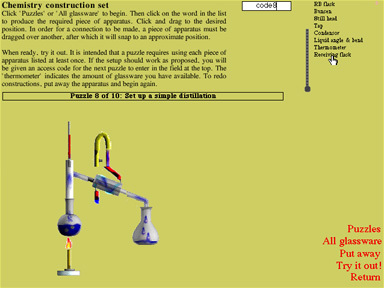 A very basic simulation of Millikan's oil drop experiment. Try setting this up in real life. Do you want to give your students open-ended problem-solving activities using glassware? Students select glassware and assemble. Correct assemblies actually work! This would be a useful program to have even on its own. Nothing is breakable! Change gas variables. 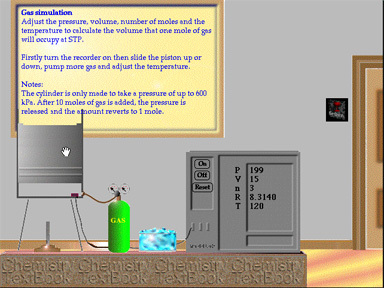 Get students to establish the volume of an ideal gas at STP. Now this just couldn't be done quickly in a normal lab class. 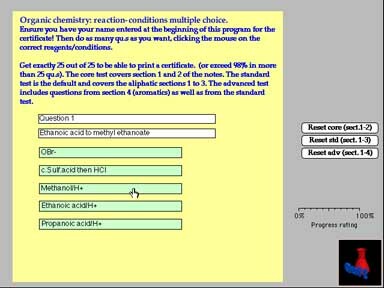 Interactive thermochemistry. 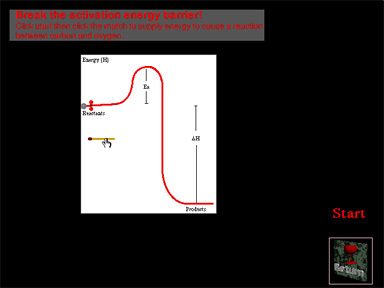 Give some reactants enough energy to drive them over the activation energy barrier. 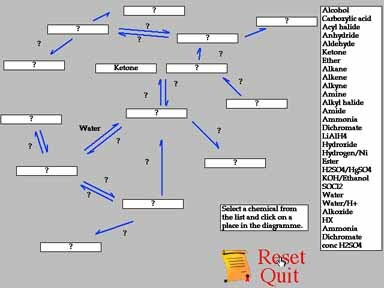 An interactive qualitative analysis simulation activity in this multimedia chemistry software where you attempt to determine an unknown ion by adding reagents and observing the reactions. Far less messy and a real advantage if done before the students undertake the actual experiment. There are multiple-choice tests as part of assessment activities for each topic. Use these, or customise with your own selection. Another assessment activity involving short- answer questions. All of these can be recorded and become easy teacher-independant assessments. 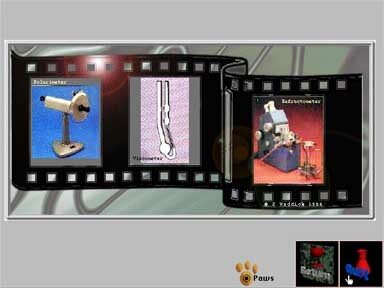 A slideshow of some examples of chemical apparatus. Basically as useless as some of the other more expensive software I've seen! 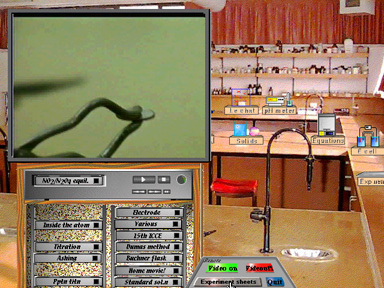 Video can be shown on the lab 'videoplayer'. Techniques can be shown before they are tried in the lab. Ever had to spend a lot of time explaining how to balance chemical equations? 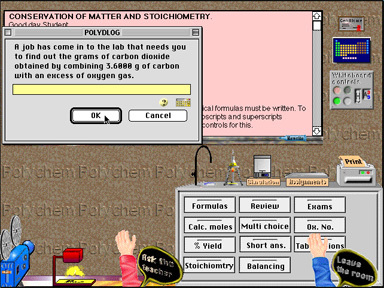 This interactive simulation enables students to gain plenty of practice in their own time. And they learn not to try and squeeze numbers into a formula! 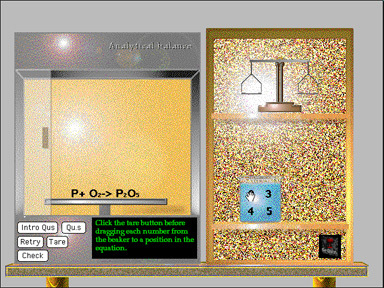 An interactive simulation that helps to use the pH meter. 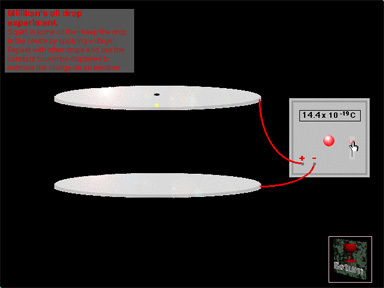 This type of simulation is intended to reduce the cognitive load in the laboratory - actually it reduces the breakages. Ever wished you didn't have to set, take in, mark and return assignments, some of which may not be the student's own? 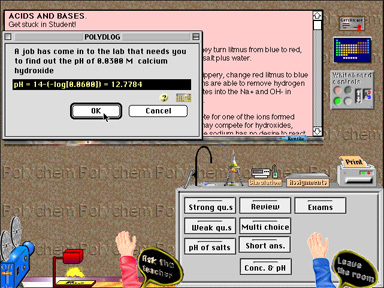 In this multimedia chemistry software, individual assignments are set, marked and recorded by the computer. This concept has reduced the workload so much that I don't dare mention it to my boss. The use of a spectrophotometer is important in many jobs. This interactive simulation can be used if there is not one available, or to give students some practice before they use the real thing, hours of fun. The values are plotted on a graph and then can be interpreted by the students. Saves hours of fun. 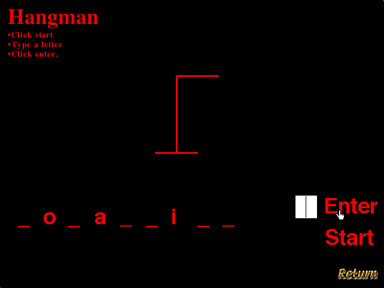 When things are a little slow, have a game of hangman. Satisfy the 'shoot 'em up' set! 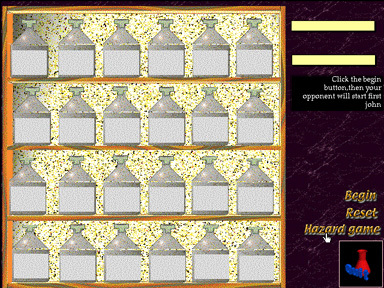 This game will help them learn the meaning of some chemical hazard signs. I haven't done any research on the effectiveness of this... but who cares? Want students to learn chemical formulas or organic nomenclature? This template is used for matching games that develop automatic memory recall, (why can't we just say 'rote learning'?) We have found it useful as a method for students to get to know each other on the first day. Do you sometimes have students who have trouble visualising what happens in an electrochemical cell? I still do! 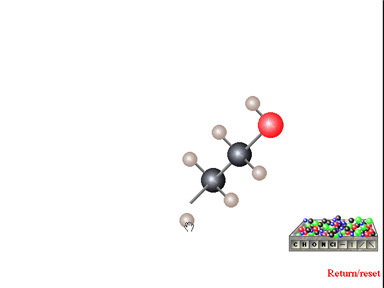 An animation that shows shapes of molecules and the concept of optical isomers. Some of the topics in the organic chemistry section. 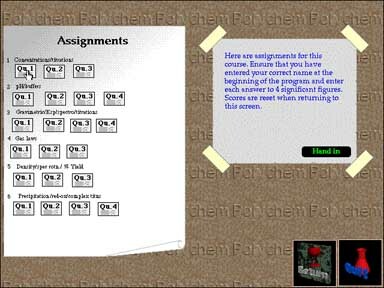 Organic chemistry starts at an introductory level with alkanes etc. and is aimed at year 12 or introductory college levels. I don't know about you, but many of our students come into the course disliking this subject. Do you sometimes have students who have trouble visualizing what happens in a buffer? Help your students see the 'real world' (whatever that is) of MSDS sheets. This is a frame from a 3 D animation. I had too much time on my hands one weekend. Has testing the solubility of solids in polar and non polar solvents has always been messy in the past? Also, those organic solvents can be pretty nasty. There has been no problem with naked flames around this software. 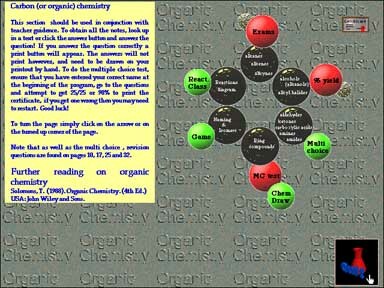 Is it possible to teach organic chemistry in an interactive and interesting way? 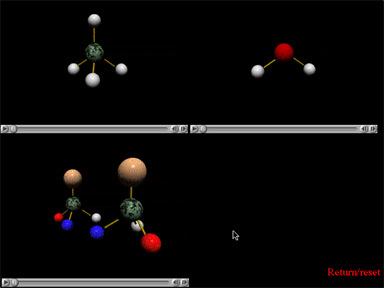 Our students spent a lot of time to see how it could be done using this multimedia chemistry software. Teacher time has been saved considerably with this computer managed test. Actually the students often support each other in groups when doing this, the social aspect of learning being an important part of the use of this software. The interconversion of organic species is an activity that will keep students gainfully employed for some time! Why have a syllabus? 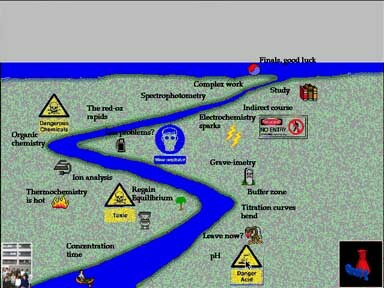 This map of the student's chemistry 'journey' through the year has provoked much more interest. 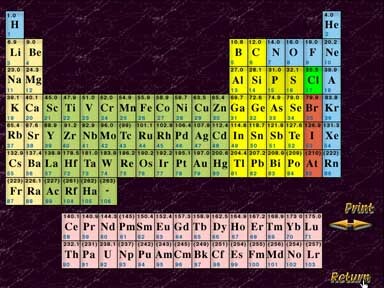 What multimedia chemistry software is complete without a periodic table? Actually it has been updated since this screen shot - why don't they stop discovering new elements??? The table also contains data about all the elements that can be used for projects along with a simple game.